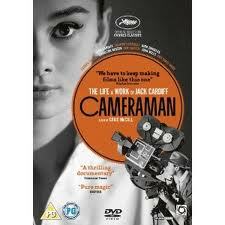 A few months ago I saw a documentary on TCM called CAMERAMAN – THE LIFE AND WORK OF JACK CARDIFF. After an astounding seventy years in the motion picture business, and with an astonishing portfolio of ground-breaking films to his credit, Cardiff’s interview in the film was both whimsical and revealing. Having established himself as England’s leading Technicolor cinematographer, Cardiff talks about being approached by the great Michael Powell to shoot his next film, A MATTER OF LIFE AND DEATH – retitled STAIRWAY TO HEAVEN in the US. 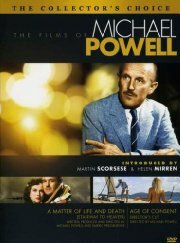 This would become an historic creative partnership between Cardiff and co-directors Michael Powell and Emeric Pressburger, that would yield A MATTER OF LIFE AND DEATH, THE RED SHOES, and BLACK NARCISSUS – three films that became the crowning achievement of England’s 1940’s/1950’s era of auteur-driven film making. Having a behind the scenes look at the making of these classic films made me hungry to see them all again, and this double bill was my first purchase. Anyone who has not experienced the mesmerizing directorial skills of the Powell/Pressburger tandem, and who appreciates inventive, daring, and surprisingly challenging film making, will be thrilled with these unique motion pictures. There’s never been anything quite like them. 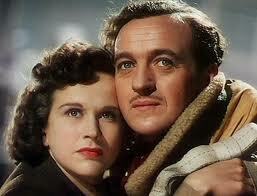 A MATTER OF LIFE AND DEATH (STAIRWAY TO HEAVEN) 1948 – Jack Cardiff’s first film with the Powell/Pressburger team – with David Niven, Kim Hunter, Robert Livesey, Raymond Massey, Marius Goring. end of the radio that he’s going to jump. Something clicks (hey, it’s a movie) between Niven and Hunter, and he say’s a wistful farewell before jumping to his certain death. But something goes wrong somehow in Heaven’s Welcome to Eternity department, and we discover Niven, washed up on a beach somewhere in England. He awakens, thinking he’s dead, only to find he has somehow survived. YES, IT’S A DEAD GUY MOVIE! But the best ever made. 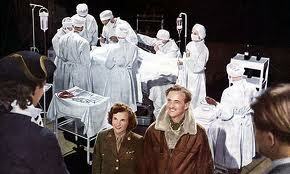 Heaven goes into damage control over its mistake, and a great trial for Niven’s mortality begins. Of course, because this is a Dead Guy Movie, he meets the girl who stole his heart over the radio in his last moments in the burning bomber (Kim Hunter) and falls head over heels. I know this sounds ridiculous, and of course it is, but Powell and Pressburger’s nimble direction and Cardiff’s extraordinary visuals turn suds into cinema, and make it all work. During pre-production, Cardiff asks Powell if Heaven will be in color, and Earth in black and white, a safe assumption. “No”, say’s Powell, “that’s just what everyone will expect”. So they flip the Heaven/Earth – Color/ B&W transition, that worked so well in The Wizard of Oz, in Earth’s colorful favor. It’s all fabulous fantasy from Powell, Pressburger, and Cardiff, who delivers ground breaking visual effects seamlessly. One of the real champs. AGE OF CONSENT – 1969 – Directed by Michael Powell, and his last film. With James Mason, a very young and astonishingly beautiful and mostly naked Helen Mirren, and Jack MacGowran. and Michael Powell tells this taboo tale without a hint of judgment. Fluff, certainly, but fascinating fluff, with a compelling Mason, as the middle aged painter with an obsession, and Mirren, as the woman/child, without a care, and without regret. A sexual taboo, dealt with by Powell, without judging its outcome. A simple film of lyrical beauty (about twenty minutes of startlingly gorgeous cinematography with a totally naked Helen Mirren swimming underwater while Mason paints away in his little boat), and well handled by all involved. This entry was posted on November 6, 2012 by shauncostello. It was filed under Fiction and non-fiction from Shaun Costello, Uncategorized and was tagged with A Matter Of Life And Death, Age Of Consent, Black Narcissus, Cameraman-The Life and Work of Jack Cardiff, Emeric Pressburger, Helen Mirren, Jack Cardiff, James Mason, Michael Powell, Sexual Taboo's, The Red Shoes.